It is hoped that "master cells" taken from umbilical cords could be used on any patient without rejection. The latest advance, published in the journal Nature Medicine, greatly multiplies the tiny number of cells from the cord ready for a transplant. UK charity Leukaemia Research said this could be the "holy grail" for doctors. The current system of bone marrow transplantation helps patients who have diseases, such as leukaemia, which affect the stem cells in their bone marrow where new blood cells are grown. Their own bone marrow cells are killed off by aggressive treatment and cells from a matched donor are introduced in their place. However, a matching donor cannot always be found, despite extensive donor registries held by organisations such as the Anthony Nolan Bone Marrow Trust and, even with a carefully matched donor, there is still a risk that the patient's body will reject the new cells. Cells extracted from umbilical cords could overcome these problems - they do not have the characteristics which would normally trigger immune rejection, so it is likely that cells from a single baby's cord could be used in any patient, without the need for matching. However, there is one big disadvantage - there are not enough cells in a single cord to meet the needs of an adult patient. Scientists have been looking for ways to either combine the cells from more than one baby, or to "expand" the cell numbers in the laboratory. The second of these options is far from straightforward - simply allowing the stem cells to divide and increase in the laboratory means that many of the resulting extra cells will be simple blood cells, which do not have the ability to produce new cells themselves. Researchers at the Fred Hutchinson Cancer Research Center in Seattle believe they may have found a way. They manipulated a "signalling pathway" in the stem cells to trigger an increase in numbers without losing their stem cell status. After success in laboratory animals, these cells were used in human patients, and the researchers found that they were accepted by the body more quickly and contributed more to the rebuilding of functioning bone marrow than "non-expanded" cord blood transplants. Dr David Grant, Scientific Director of charity Leukaemia Research said: "The holy grail is to have an 'off the peg' source of unlimited numbers of 'neutral' stem cells which can be given to any patient safe in the knowledge that they will not cause the very difficult 'graft versus host' problems that lead to rejection and often the death of the patient. "This is a promising development towards this because the concern has been that once stem cells start 'growing' they lose their stem cell properties and progress to ordinary blood cells with a very limited lifespan." Henny Braund, chief executive of The Anthony Nolan Trust, said the potential for umbilical cord blood was "huge", and that the charity had already imported well over 250 units of umbilical cord blood. "Sadly in the UK, despite our scientific expertise, umbilical cord blood is still very much an untapped resource and we are only able to collect and store a tiny amount of the cords we need. "We really need a properly resourced UK cord blood collection programme. "Further investment is crucial if we are to capitalise on this amazing resource and save more lives." 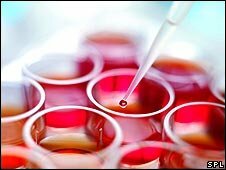 What next for stem cell research?